There was a time when I would have related to this book from the point of view of one of the daughters. But now, I am in complete sympathy with their mother. Lara married their father while he was still mourning the loss of his first wife. She loved his two eldest daughters as her very own, and proceeded to have two more children. These three daughters’ lives are what comprise the story. That, and their relationship with their mother. When you’re a daughter, you don’t understand how much your mother longs to protect you. To teach you, perhaps from her own errors, so that you don’t fall into the same mistakes. When you’re a mother, you forget how that desire to protect can often turn into hovering, and certainly be construed as interfering. Such a tightrope we walk, in either role, loving each other and yet needing to walk our own paths. As Eve, one of Lara’s daughters, plans her wedding it becomes increasingly apparent that things are amiss. Her fiance is seen with another woman. Eve’s face is more stoic than radiant. She is determined not to make any changes to her wedding plans despite her family’s concerns, despite what might be concerning herself deep down inside. Against this backdrop is Lara’s grief, still fierce over giving birth to a stillborn son. The events of our lives, which cause us to celebrate or grieve, are so often beyond our control. It is how we accept what comes our way that determines our happiness, that sets the foundation for our future. I like how Elizabeth Buchan writes of marriage, and of relationships, particularly from a woman’s perspective. She is able to convey exactly what it is to be a mother, a daughter, a wife, or a lover. She captures the nuances of each role and imbues her characters with such honesty that we feel a deep connection with them. In Daughters, she writes a novel which had me holding my breath to the very end, wondering just how the women would resolve their issues. 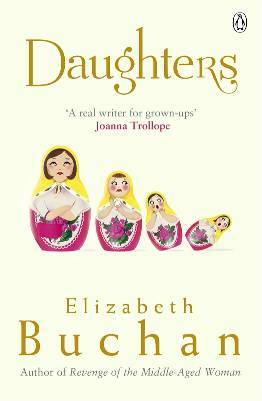 My thanks to Penguin UK, for sending me Daughters by Elizabeth Buchan, released March 1, 2012, for a promised review. Previous Post Lent. And, A Blogging Break. It sounds like Buchan is quite talented. This book sounds wonderful. I'd probably relate more to the mother these days as well. This sounds like an intense read. I'm in my mid-20s and my relationship with my mum is changing again as I'm completely becoming an adult. I like the sound of this book. At this point in life, I'd sympathize with the mother, too. It sounds like a wonderful book and I love the cover. 'Such a tightrope we walk' – ain't it the truth. Having two daughters, I just know the feeling. This book sounds so interesting. I've always been interested in mother-daughter relationships (my thesis discussed this subject in depth), so I'm definitely interested in reading this book. Thanks so much for reviewing it and bringing it to my attention 🙂 Can't wait to read it! Cheers! Ooooh — I'm intrigued! Sometimes mother-daughter books touch a nerve for me but in this case, I think the discomfort might be good. I do like a novel that hurts (in a good way, you know?). Also, I adore the cover. I tried Buchan's “Revenge of the Middle-Aged Woman” and didn't care for it one bit, but this sounds like one I'd like to try. Everyone deserves a second chance, no?